This chapter presents a multi-portfolio approach for the time and space integrated decision-making in a supply chain under disruption risks. In the context of supply chain disruptions, the portfolio is defined as the allocation of demand for parts among suppliers or the allocation of demand for products among production facilities. A disruptive event is assumed to impact both primary suppliers of parts and the firm primary assembly plant. Then, the firm selects recovery suppliers, recovery plants along with transshipment of parts from disabled primary plant to recovery plants and production and inventory planning in recovery plants. The mitigation and recovery decisions are integrated over time and space: the primary portfolios to be implemented before a disruptive event are optimized simultaneously with recovery portfolios for the aftermath period as well as the portfolios for both part suppliers and product manufacturers in different geographic regions are determined simultaneously. Using conditional cost at risk and conditional service at risk as risk measures, the risk-averse solutions are obtained. The solution results are compared for different demand patterns. The findings indicate that when the objective is to optimize service level with no regard to costs, both supply and demand portfolios are more diversified. The findings also demonstrate that the developed multi-portfolio approach leads to computationally efficient stochastic MIP models with a very strong LP relaxation. 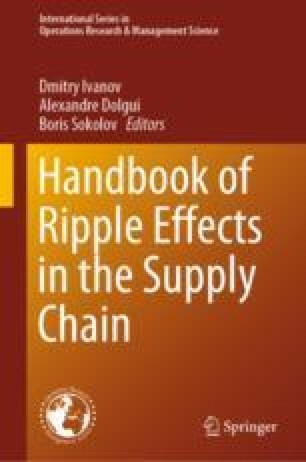 The proposed multi-portfolio approach that allows for the time and space integrated decision-making may help to better mitigate the impact of disruption propagation on supply chain performance, i.e., the ripple effect. The author wishes to thank the editors for their invitation to contribute to this handbook. Sawik, T. (2018c). Two-period vs. multi-period model for supply chain disruption management. International Journal of Production Research. https://doi.org/10.1080/00207543.2018.1504246. Article in press.